Welcome to your grocer's freezer. Put on a coat. You'll be here for awhile. 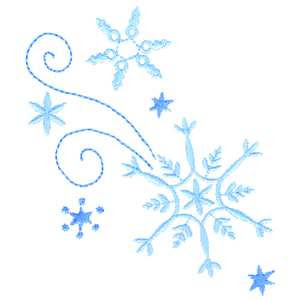 It's like walking in a winter wonderland so smile. REGULAR CUTS - Just that. The standard size fries we all know and love. They are a half -inch thick and about three to four inches long. SHOESTRINGS - Slightly longer and a quarter-inch thick. What you traditionally get at McDonald's or Burger King. CRINKLE CUTS - Just like regular cuts only with a wavy horizontal pattern on every side. Also come as pixie sized or shoestrings with crinkle cuts. STEAK FRIES - Big planks. Typically an inch thick and four to five inches long. Can also come with a vertical crinkle cut or with skin on. SEASONED - Usually regular cuts but covered with batter, pepper, paprika and other such zesty spices. Other flavors include cracked black pepper, fajita, hot, jalapeno and sassy salt and vinegar. TATER TOTS - Inch long three quarter inch cylinders made of processed (chopped up) potato. Designed to be crunchy on the outside and soft on the inside. Sometimes seasoned and sometimes with chunks of onion. Also available at half-sized. NATURAL CUTS - regular cuts with the skin still on. DICED - Also known as hash browns, potatoes O'Brien or breakfast potatoes. Diced into quarter inch or inch cubes. Sometimes include onion or pepper bits. WEDGES - Just like they sound, steak fries-sized three sided wedges of potato with the skin still on. FAST FRIES - Amazing shoestrings coated with a magic chemical which allows them to cook in an oven three times faster than other French fries. So named for fast food fries. CROWNS - Flat inch wide coins or medallions of the same consistency as Tater Tots. CRISPERS - Like Crowns or Tater Tots these are made from processed potato. Regular Cut-sized. Soft inside with extra-crispy bumpy shells designed for (what else?) extra crispness. The late great Tasti-Fries from Birdseye were of this variety with soft insides and crunchy vertical lines up and down the fry itself. Mmmmm, tasty. TWISTS - Also known as curly fries, loops, corkscrews and spirals. Specially cut through the miracle of science into corkscrew shapes usually the width of shoestrings only much much longer. Sometimes seasoned and usually with the skin on. CHIPS - Just your standard potato disc a quarter inch thick of varying diameter (one to four inches) usually with the skin on. Sometimes they can be crinkle cut. Pretty much exclusively for breakfast. WAFFLE FRIES - Also known as lattice, criss-cross or gaufrette. Another cut of miracle proportions. Take a potato disc a quarter inch thick of varying diameter (one to four inches) usually with the skin on, cut the top like a crinkle cut then flip it and spin it, then crinkle cut that side for a criss-cross effect. MATCHSTICK FRIES - Also known as allumette or potato sticks. Shoestrings an eighth of an inch thick. BATTER FRIES - Usually regular cuts with a coating of breading or beer or corn batter that makes them have a more crispy outside. SHREDDED - Tiny eighth inch strips of potato. Also known as hash browns because they can be fried into a hash brown-like patty. Usually served with breakfast. 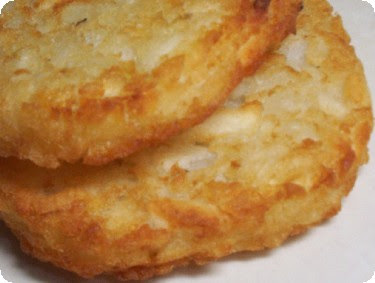 HASH BROWNS - Patties of processed potato similar to long flat tater tots. Half inch thick, five inches long and two inches wide. SHAPES - Processed potato shaped into various forms such as smiley faces or letters of the alphabet. Fun but rarely tasty. Now all these types start from potatoes dug out of the ground, washed, steam-peeled, sorted, cut, blanched, dried, par-fried, shaken and frozen all before they get into our hungry hands in the grocer's freezer. We'll stop here for the moment as you're probably freezing to death from standing in your grocer's freezer. Keep in mind though the cold is your friend. 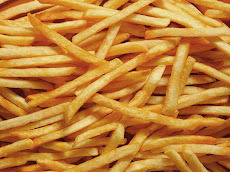 Without it your fries wouldn't be able to stay fresh for you so long. Ah, the miracle of science. My whole family actually likes the McCain brand smiley face potatoes. The flavor is very close to the ones served in Bob Evans restaurants.